I've always been fascinated by cubism, so over last summer and stretching well into the fall, I found myself wrapped up in drawing a series of fruits and vegetables that later ventured into some insects too. I used Pitt pens by Faber-Castell, and used Derwent Inktense acrylic ink pencils to "watercolor" them in. I love this! It's brilliant. 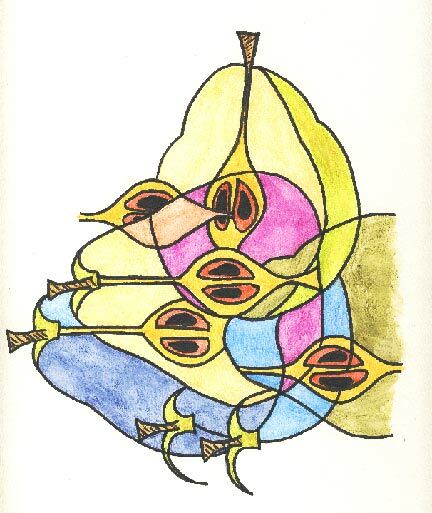 Love the "cubist" feel to it and the fact that there are some uncoloured areas, and the overlapping pears make for some very interesting shapes. It's very imaginative. I have some Inktense pencils and love them for colouring Zentangles. Shoshi, thank you! I went to see some of your zentangles, and I'm just blown away by your talent!! Thank you for your lovely reply, Cyndi, and for visiting my blog. You can see all my Zentangles (inluding the ZIAs) on the Zentangle Gallery tab at the top of my blog. The "Rising Towards the Light" ZIA is about to be published in a new Zentangle book by Jane Marbaix coming out in May. Interesting...3 of my buds here in Florida are going to play with Inktense blocks on the 15th of April! Love seeing any work using their pencils or blocks. I've heard about the Pitt pens...look forward to seing more from you using these!! Thanks! I am not giving the Inktense pencils full reign in these pieces, Robbie. They can mix and blend, and do all sorts of wonderful watercolory things. Googling them is an eyeful! !